Denise Hayes says she put signs on her front door and back window of her home near Rancho and Alta Drives after burglars hit her house for the second time in 2018. Denise Hayes says she put that sign on her front door and back window of her home near Rancho and Alta drives after burglars hit her house for the second time in 2018. 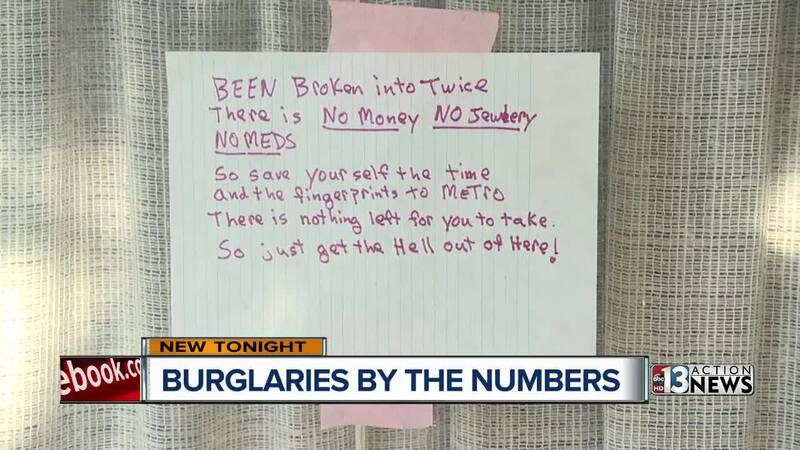 "I do a check every day when I come in to see where the new hole is or where the new window is broken into," Hayes said of her routine upon returning home. In the 24 years she lived at the home, Hayes said she has never been burglarized until this year. The first time she said the crooks broke a back window and stole jewelry and about $40 in change. While she didn't report the first burglary to police because she didn't think it was worth it. Then months later she was hit again, this time the burglars doing even more damage. "They punched a hole in my back wall and came through over my kitchen sink. Knocked out the wall," Hayes said. Hayes says she is constantly talking to her neighbors who have also been victimized. "Through the kitty door and stole some weapons from his house and then they broke through another neighbor down the street and flat out kicked in the door," Hayes said pointing to her neighbors. While those who are recent victims are working to step up their security, crime numbers tell a different story. Las Vegas police show a 4.6 percent decrease in burglaries throughout their jurisdiction compared with the same time last year. With only 3 of the 9 area commands showing an increase in burglaries. While the numbers are down for the entire year, some areas commands are providing tips to help residents protect themselves from criminals. Hayes says she and her neighbors are following much of that advice, even snapping pictures of suspicious people in the area to pass along to officers.